This AddOn provides an additional circular action bar that normally remains hidden but can be summoned by a click of a (mouse) button. The RingMenu is hence ideal for storing away action buttons that are frequently used yet need not be present on the screen at all times (e.g. trade skills, tracking spells, hearthstone, etc.). and choose an appropriate button. This can be any keyboard or mouse button, e.g. the middle mouse button. Open the RingMenu by clicking the summon button anywhere on the screen. 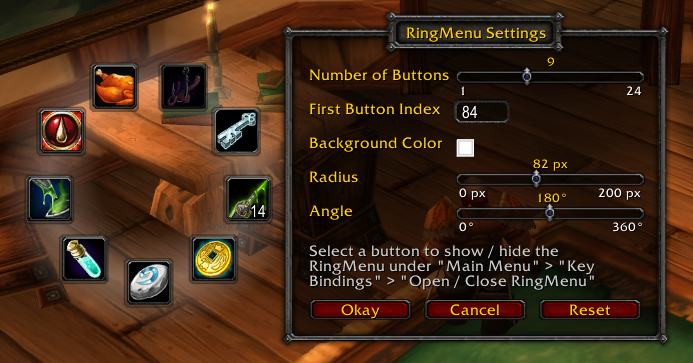 You can now drag and drop actions to the slots of the RingMenu like for a regular action bar. Open the settings window by typing /ringmenu. Using the First Button Slot and Number of Buttons settings, you can adjust the range of action button slots that are used for the RingMenu. Depending on your class, some button slot ranges might be already in use for shapeshift forms. Use this list to pick an appropriate range. Further configuration options include the radius and angle of the RingMenu as well as the color of the transparent backdrop. Feel free to report bugs or suggestions here in this forum or using the issue tracker. Last edited by jsb on Sun Nov 08, 2015 2:50 pm, edited 4 times in total. I like the idea behind it, not sure if I'm gonna use it but I may take a look at it. 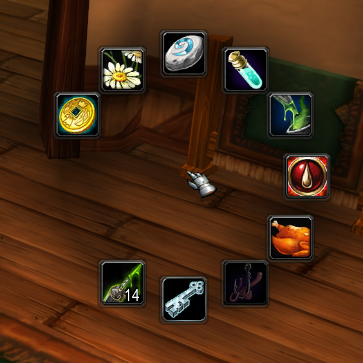 I truly enjoy this addon, it is perfect for professions and consumables and less used macros! Last edited by Hashmire on Mon Aug 31, 2015 5:11 pm, edited 1 time in total. Forgot to come back and here and mentioned I tested this addon. I honestly really like it. While I could simply just place my profession skills on a side bar its nice to just click a button and have it appear right next to wherever my cursor may be. The way the bar appears and disappears seems so fluid too. So all in all, works great! Awesome addon, thanks for making it! Edit : I'm in love. Always wanted to visually get rid of those buttons and have them available quickly whenever I want. Thank you very much. Thanks for this neat addon. Very useful for non-keybinded actions that you still want to access fast like professions and consumables. Would it be possible to make it compatible with cyCircled so users can customize the borders of the action buttons? cyCircled already has plugin files for other addons like Bartender2, Bongos, etc. Would be cool if you could create a plugin file for RingMenu aswell! Wow, that is....surprisingly useful. Clears up a lot of action bar space.